The first time I had this magnificent dessert was in India. The moment I took my first bite I thought I had found dessert paradise! From then on whenever I was in a restaurant and I saw it on the menu I had to order it. I make this wonderful dessert only during special occasions & surprise pravin by saying "JUST FOR U". Tiramisu is one of the most widely recognized Italian desserts. In Italian the word for this sweet dessert actually means "pick me up", likely referring to the caffein-laden espresso used to make this delectable treat. Tiramisu consist of two layers of lady fingers soaked in espresso with the optional addition of liquor and sugar, filled and iced with whipped cream and mascarpone cheese and garnished with the chocolate shavings, which is refrigerated before being served. I recommend you actually use real espresso in this recipe, as the authentic flavor of the dish only shines through when real Italian ingredients are used. Also, you may find it difficult to find savoiardi (ladyfingers) that adequately soak up the coffee. I suggest looking for an Italian brand cookie (alternatively sponge cakes can be used) . Then get ready to make a "WOW"-ing dessert! Prepare a strong espresso coffee using coffeefilter. Dissolve 2 tsp sugar & 2 tbsp marasala wine in it. Beat the cream & egg whites seperately till stiff. Keep it aside. Whisk the egg yolks, sugar and marsala wine in a large glass bowl until blended. Set the bowl over a saucepan of simmering water, but do not allow the bottom of the bowl to touch the water. Whisk the egg mixture over the simmering water until it is thick and creamy, about 4 minutes. Remove from the heat. Mash the mascarpone cheese until creamy. Add the egg yolk mixture into the mascarpone cheese and beat to mix very well. Finally fold the cream & egg whites gently into the mascarpone cheese mixture. Dip lady's finger into the cooled coffee on a shallow container (Do not dip too long as the lady's finger turn soggy very quickly). Refrigerate for at least 6 hours, preferably ovenight. Hi Swapna, really good effort! looks fantastic. wow really wonderful dessert..OUt fav dessert in the house. 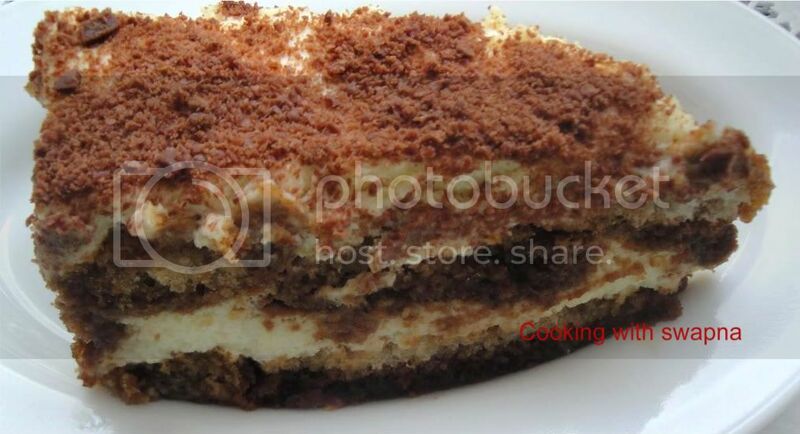 I make this very often..I too have posted tiramisu but without eggs..
looks fantastic..something which I wanted to try for a long time..
Looks tempting..i am familiar with this delicious dessert..youra have come truly professional !! Grt look swapna..u took so much effort..But I dint quite understand the 3rd step.."do not allow the bottom of the bowl to touch the water. "..is that we shudnt allow the bowl to touch the bottom of saucepan? Thank u all for ur lovely comments. Step 3: is nothing but double boiling method. 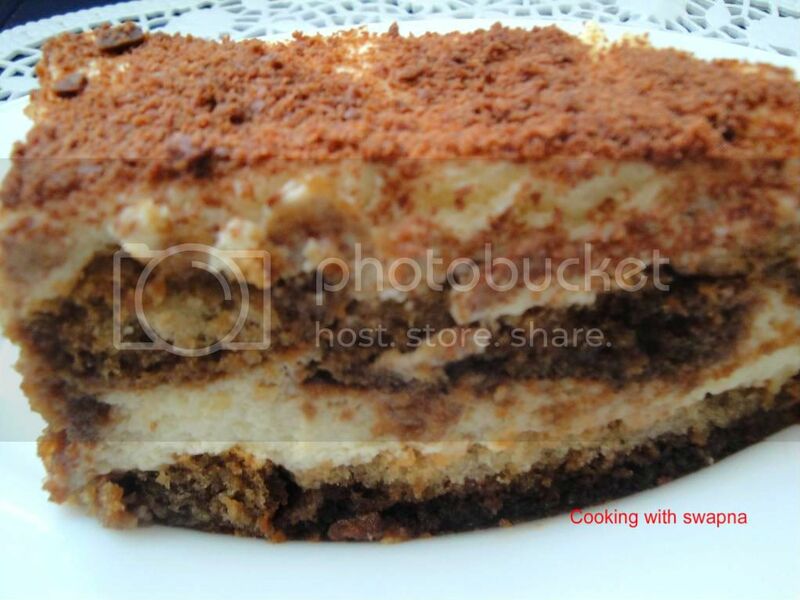 First time here...You have a nice blog Swapna...Nice recipes and presentation...Just love the Tiramisu...looks Yum...Thanks for sharing. wow this looks awesome..i m already drooling..
wow that looks superb...u have a nice blog dear..just 2 months and u have written so much...thats cool..keep up the good work..
hm gorgeous dear.. looks beautiful and inviting.